Summary: Learn how to paint doors and door frames, remove old paint with a hot air gun, remove old paint with chemical paint stripper and prepare the surface to paint. Most people at some point have attempted to paint a door. When it comes to painting the most important thing to remember is the quality of the finish will depend on how thoroughly the surface has been prepared. Remove all door furniture to prevent damage occurring when preparing the door for painting. It is possible to paint over existing paintwork, but only if it's in good condition and the thickness of the old paint doesn't make it difficult to close the door. However, it is still important to provide a key in the existing paintwork using a power sander with a fine abrasive paper. To remove any grease, grime and even nicotine stains wash the surface with a solution of hot water and sugar soap, which is a non-caustic powder cleaner used by professional decorators as it makes repainting easier. If removing the paint is necessary there are two ways to strip old paint from woodwork: a hot air gun or paint stripper. Using a hot air gun softens the paint so a scraper can be used to remove it. Keep the hot air gun a few centimetres from the wood and after a few seconds as the paint begins to soften and bubble scrape it away with a paint scraper. Gradually move over the surface of the door. 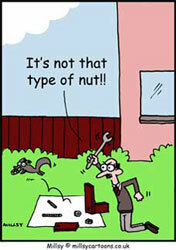 Avoid holding the hot air gun directly over one area for too long to prevent scorching the wood. When removing paint from woodwork in old buildings remember that pre-sixties paint is likely to contain lead, so it is advisable to wear gloves and a disposable facemask. Apply the paint stripper to the paintwork with an old paintbrush using dabbing strokes. Modern liquid paint strippers are water-based, non-hazardous, non-caustic, solvent-free, non-combustible and do not cause irritation when coming into contact with skin. Leave for about 15 minutes to allow the chemical to react with the paint causing it to wrinkle, then scrape it away using a paint scraper on flat surfaces and a shave hook for any recesses. Having removed all the old paint, inspect the door for cracks and blemishes. Repair this type of surface damage with filler and sand the door with a fine abrasive paper in the direction of the grain. New bare wood should always have a primer applied to protect the wood and provide a good surface for the undercoat. But prior to this any wood knots should be treated with knotting to seal them. Wooden doors that have been painted before only need to have primer applied to areas where filler has been used to repair cracks and blemishes. The door should now be painted with an undercoat that will increase the opacity of the surface and provide a good surface on which to apply the topcoat. It may be necessary to apply two coats of undercoat to adequately cover primer or wood colour. Once the undercoat is dry the door is ready to be painted with the decorative topcoat. When painting a panel door use a suitably sized paintbrush for different parts of the door and paint each section separately. A 50mm (2 in) brush is normally suitable for the panels and the horizontal and vertical surrounds, while it is easier using a 25mm (1 in) for the architrave and door edge. Remember that if you are using a different colour on either side of the door, the door edge should be painted the same colour as the side of the door that opens into the room. When painting it's best to hold the brush at the top of the ferrule (the metal band around the paint brush) for greater control, but smaller brushes can be held like a pencil. Do not overload the brush with paint. 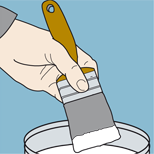 Dip the brush about one third of the bristle length into the paint and remove excess paint by pulling both sides of the brush across the rim of the tin. 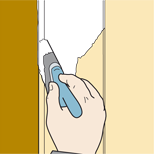 When painting the doorframe it will be necessary to use a technique called "cutting in", which means creating an exact line between the painted doorframe and the surrounding wall. The brush should be addressed to the frame where the two surfaces come together and drawn along the doorframe to create a very small raised line of paint called a "bead" where the two surfaces meet. Hold the brush by the ferrule and only dip the brush to about one third of the bristle length. Address the brush to the frame where the two surfaces come together and draw along the doorframe to create a very small raised line of paint.